How am I doing. Any tips. First and foremost I hope you are enjoying the game. I think we are very similar in our progression with the game content. 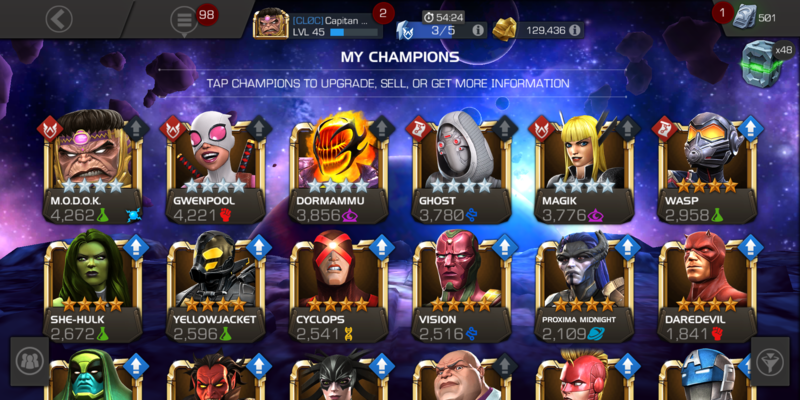 I've been playing under 60 days so if you are still under 60 days keep maximizing arena for new champs. You have some good champs to work with but I think you will get to a roadblock when you start to need T4CC. While you are accumulating these catalysts and fragments you should plan on who you will rank up and how long you want to play the game. If you plan to play the game for quite some time, maybe months more or years then consider which four and five stars to build up. 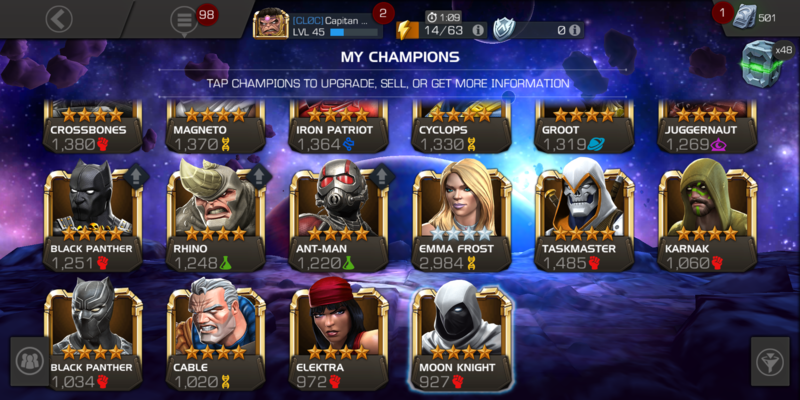 Do your research on who are the best champions from each class. People will tell you this and that champion is the best, but the more you here a certain champ is one of the best then you can be assured it ranks up there. Examples of these are corvus, medusa, omega red, ghost, and so on. Magik, ghost, vision, hulk, she-hulk, gwenpool are the champs I would focus on. 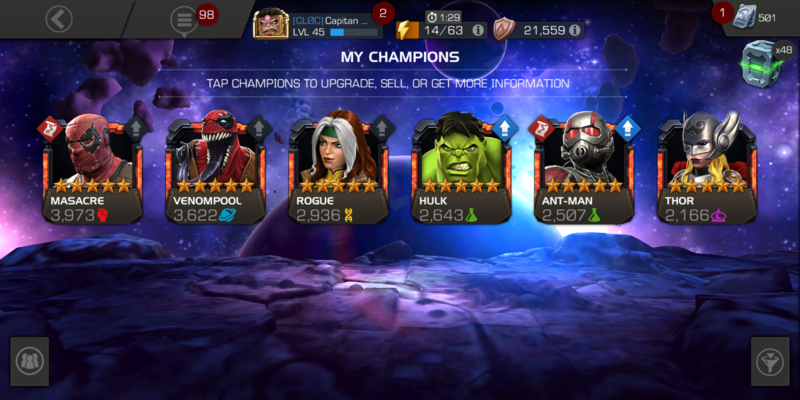 My best advice for you right now is to not use any T4CC yet until you get better champs. I would like to see a more diverse amount of end game champs before I would use T4CC and other rare things such as T2A T5B (rank up materials). Great work and keep it up. 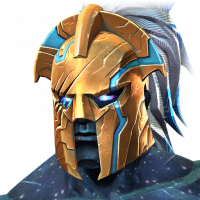 Aquire more champs and play daily. Do note that of the ones I said I would focus on that I mean to rank up for clearing content. 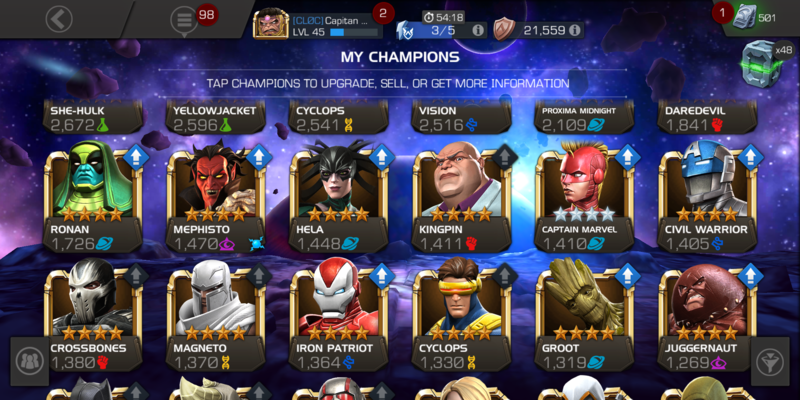 Some of those I would not rank up past rank 3 or 4 four star. They have good use though in comparison to some of your other champs. Rogue = she can gain heal and power drain, W´hen u dupe her she can heal around dobbelt the amount. the other 5 star i wudnt rank,. Magik = power lock, power control, prob the best of the power control champs out there, Learn the intercep and corner trick and u will almost be able to powerlock ur enemy all fight. U will also need immunities champs. and i wud say CB is a good option.